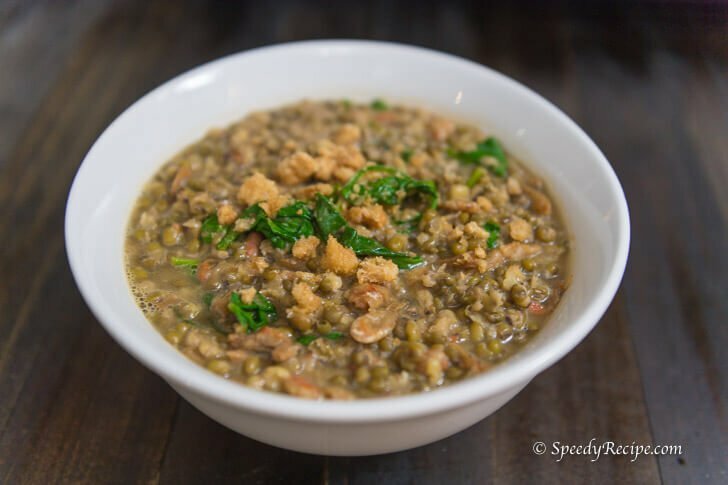 Ginisang Munggo or Sauteed Mung Beans with Spinach is a simple yet nice tasting Filipino vegetable dish. This is usually eaten as a main dish along with warm white rice. Some versions use fish, while there are others that make use of thin slices of pork. I made my monggo guisado (this is what people sometimes use to refer to this dish) with dried small shrimp. It resembles “hibi”, which is a similar ingredient that I used to utilize when I was still in the Philippines. However, the latter has no head and shell, unlike this one. You can souce dried shrimp from Korean grocery stores. I got mine from there. It is important to prepare the mung beans hour or a day before cooking. It should be soaked in water until it becomes softer, in order to make the cooking time shorter. I usually soak these overnight, but 3 hours should be enough. There are several ways to cook ginisang munggo. I was able to share a handful in my Filipino food blog. The Filipino way of eating munggo is either to have it only with rice, or to partner this with a fried or grilled dish, such as fried fish or grilled pork and still eat the combo with rice. This will make your experience more enjoyable. I suggest that you also check out Adobong Kangkong. This is another easy to cook Pinoy vegetable recipe. Try this ginisang munggo recipe. 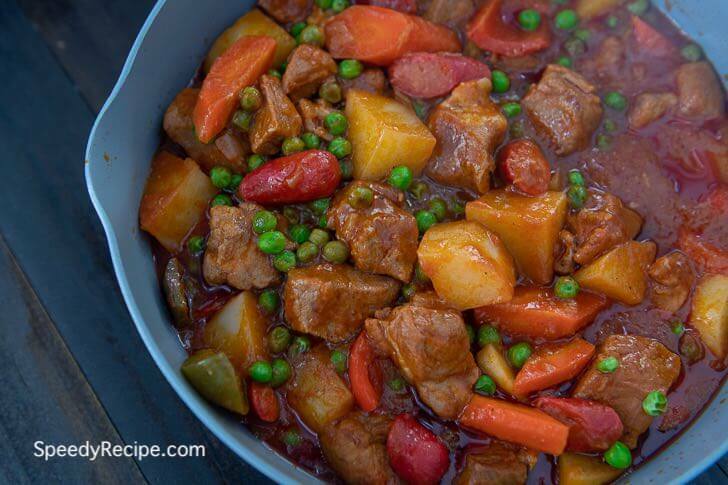 Enjoy this with newly cooked warm white rice. 1 cup mung beans soaked in 2 cups water for 3 hrs. Saute onion, garlic, and tomato. Add dried shrimp and mung beans. Stir. Pour beef broth. Let boil. Cover and cook between low to medium heat until mung beans are soft. Add spinach. Stir.Cook for 1 minute. Transfer to a serving bowl. Top with crushed chicharon.